Would like to say: Thank You Pierre, What a difference you made in us and our horses! We are looking forward to you coming back soon!!! Classical principals with a modern approach. Professional French rider and instructor, specializing in dressage training and teaching, from beginner level to Grand Prix, Pierre emphasizes lightness and harmony with the horse. Teaching classical principles with a modern approach. Adding the bio-mechanical knowledge of the horse that we have today with the classical principles of dressage. Building strong foundations are essential! Going back to basics always solves problems. Without the basics, dressage is not possible. 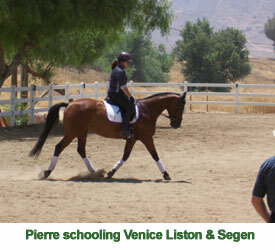 Pierre believes positive reinforcement and strengthening the bond between horse and rider is critical. With over 20 years background in dressage training and instruction, Pierre start his riding and training foundation schooling with some of the finest dressage trainers of France. Pierre has taught and trained for the past 11 years here in Northern California's wine country.